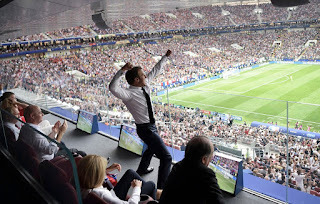 A brief historical outline of the FIFA World Cup™ Competition. Japanese company ASICS Corporation was started in 1949. The name is a pneumonic for "anima sana in corpore sano" (you should pray to have a sound mind in a sound body). Attributed to Juvenal 2nd A.D. Soccer was introduced into the PE classes of Japanese elementary school in 1962 and the game became very popular. In 1962 soccer boots were made of cloth with three studs on the heel and four on the ball of the shoe. 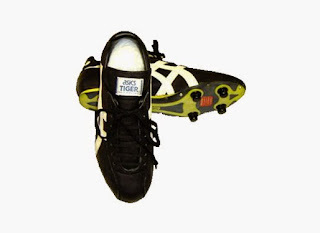 In 1964, leather soccer shoes were also released on a trial basis. 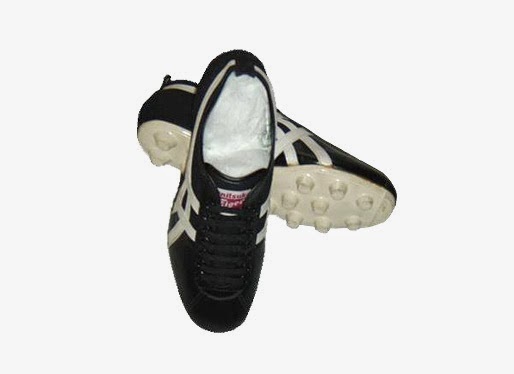 The company began to supply a range of quality soccer boots in 1966 with "SOCCER KAWA A" and "SOCCER KAWA AA. " These had soft uppers made of leather with interchangeable cleats to adjust to any kind of surface condition. A resin (nylon) sheet was used on the sole to provide the twin benefits of repellence and bounce prevention. A sponge was added between the upper and the sole, and further reinforcement was provided for with nails around the edge. 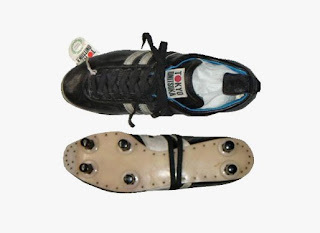 The KAWA A, unlike the KAWA AA, did not come with interchangeable studs, but was adapted for Japanese soccer grounds with a suitable rubber compound. In 1971 the company introduced the CHAPE 201. 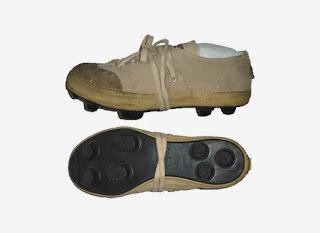 This was a lightweight yet sturdy soccer shoe which incorporated new technology to stabilise the cleats. This was thought to isolate the foot from cleat pressure during the impact of landing. 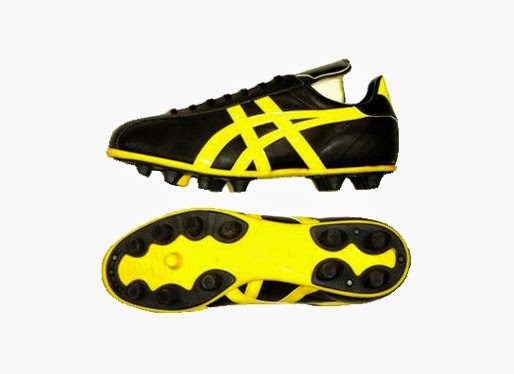 Aluminum studs were replaced with polycarbonate resin and soccer shoes bore the Mexico line (the current ASICS stripe) in yellow. By the 80s soccer shoes incorporated a two-tone resin sole and were made on a last that emphasized the function of running. A hard sponge was inserted in the heel for a structure that allowed the user to retain a forward-leaning stance, and act as a shock absorber. Since the studs required changing, the sponging was designed with consideration to deformation. The "BOMBER" series had a black sole, and the fabric of the uppers incorporated rubber on the toe and heel for extra support and shock absorption. "BOMBER 45" had a white sole which was quite unusual at the time, and used synthetic leather on the toe. The soles were sewn using "ARIAN THREAD." The style quickly established itself and soon most soccer players in Japan were wearing them. In 1986 The Injector PF Series was released incorporating a unit sole that combined rubber studs for stopping power and durability with a polyurethane resin in the main body for lightness and bounce. The rubber studs were first pressed, and then inserted in an injection mold, and a polyurethane resin was finally injected into it. The innovative construction method relied on the reaction of the rubber treatment agent without using glue. Though the metal mold of the rubber press was developed through countless trial and error and at considerable costs, it had a huge impact on future molding machines. Of the three models released in the first year, the PF-III was the highest grade with oil-tanned calfskin. 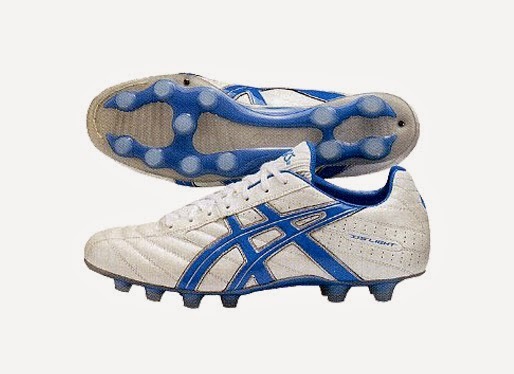 In the same year ASICS Gel Lethal design was released and incorporated new design features including elevated heels which gave mechanical advantage to the player when propelling forward in accelerated movements. The emphasis on boot construction is lightweight, robust with waterproof uppers and ground midsole. Polyurethane outsoles are board lasted for stability and a selection of sole units suited to various conditions and preferences are available. These include some boots with tradition 4/2 stud arrangement or others offering the Asics’s circular cleat design referred to as the M.F.C. Ongoing research collaboration with Sports Medicine Australia strive to provide boots suitable for hard surfaces and warm climates. Asics are one of the few boot makers to custom design boots for goal keepers The Janus JP Series was released in 2006. 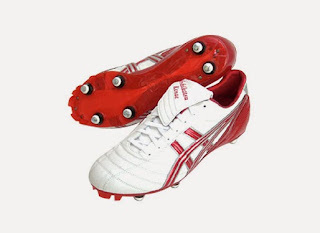 The signature model was used by Yoshikatsu Kawaguchi in the FIFA World Cup Germany 2006. Brazilian Goal Keepers: Júlio César and Jefferson de Oliveira Galvão (aka Jefferson) wore ASICS soccer boots during the FIFA World Cup Brazil 2014. 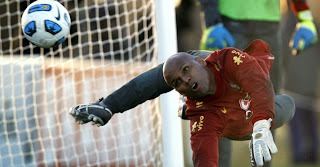 Vuvazulas and Football Rattles: Where have they gone? Disclaimer: Reliance on information, material, advice, or other linked or recommended resources, received from Cameron Kippen, shall be at your sole risk, and Cameron Kippen assumes no responsibility for any errors, omissions, or damages arising. Users of this website are encouraged to confirm information received with other sources, and to seek local qualified advice if embarking on any actions that could carry personal or organisational liabilities. Please retain this notice on all copies. © cameron kippen 2018. Cameron Kippen is a shoe historian and retired lecturer in podology. 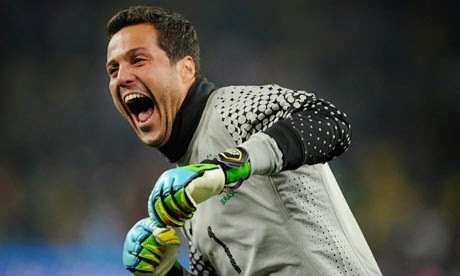 He has no association with FIFA or affiliation with any soccer organisations, footwear manufacturer, or retailer. The information on this blog has been collected and reported in good faith and wherever possible, from refereed materials. Where triangulation was not possible, information was taken at face value and unless stated otherwise represents the opinions of the author.